Starting today every Sunday I will share my favorite articles and finds from around the Internet. I find so much great stuff throughout the week I wanted to share it here with you! I will include tips, DIYs, shopping, helpful stuff, and informative resources. What did you find this week? Have you read any of this too? 1. April at Blacksburg Belle has a post (it isn’t new but it is to me) of 50 Art Journal Prompts, I am working on a summer journal challenge over at Oh My! Handmade Goodness and this list is super helpful. You can find her list here. If you haven’t checked out her blog yet, please do! 2. As an avid crocheter I love this idea from Ruby Murrays Musings about crocheting your journal!!! I think this recipe for Apple Nachos from Taste of Home needs no explanation. Just look at the picture! Yumm! I have a Pinterest board of “Projects To Work On”. It is one of those places I throw all the things I want to try ASAP and then… never get to! But I am still gonna keep on finding stuff and now I will share it with you! 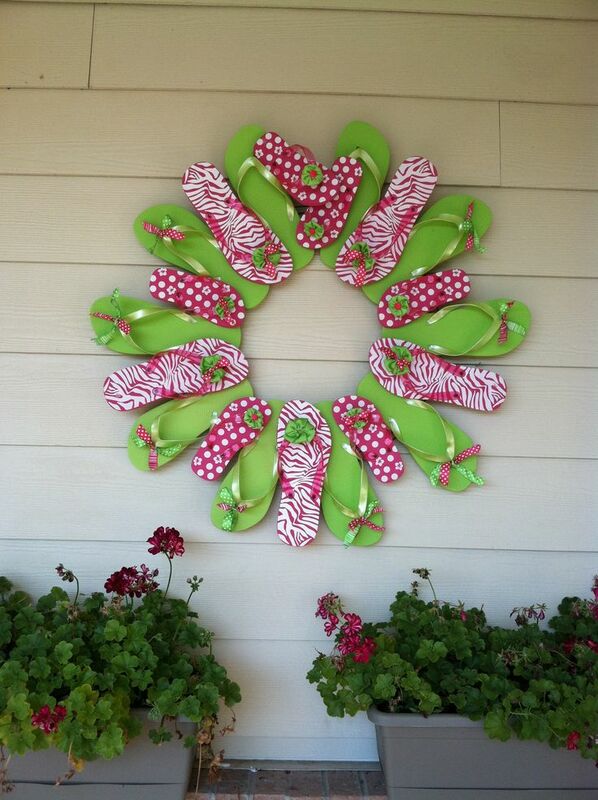 I couldn’t find the source for this Flip Flop Wreath so if anyone knows where it came from please share it!!! It is super cute and I think it would be pretty quick to put together. You can find $.99 flip flops almost anywhere now. I am obsessed with the printable bucket lists all over the internet. I love love love them and have been collecting summer bucket lists for awhile now. At the end of most summers I get very sad and think of all the stuff I haven’t done. I think having a list like this could help eliminate this issue. I am in the process of creating my own but in the mean time here is one I found that is great. Hope you enjoyed! Let me know if you try anything here I am very curious. What did you read this week? Things are getting very exciting around here. Its official! My crocheted crafts are sitting in a store, ya me! I live in New Hampshire and am soo excited to announce a great new store called Crafting Amongst Friends. This a great little shop that features all kinds of local crafters. This is one of those stores where you will find all those great little items that you will never find anywhere else. From décor to jewelry to apparel and purses, they offer something for everyone! Interestingly I heard about them from my hairdresser sister who gets all of the gossip in town. As someone just starting out their handmade business this opportunity is very exciting for me. I have had an Etsy shop since December and while I know that I desperately need more listings (which means more time to make) I haven’t had a lot of success. I am determined to spend the next few months filling my shop with lots of goodies for summer, weddings, and babies. Unfortunately none of this will happen until I have some more time to create, in about a week after finals are over. But believe me you will be seeing some very cool things in the “summer line”. In the meantime though my very favorite creations are being consigned in this beautiful new shop. Seeing my items in a store is just about the coolest feeling in the world. Now I see where the entrepreneurship “rush” and excitement comes from. I highly recommend checking this place out if you are in the area. Not only can you get some very cool and unique things but you are supporting your local artisans and community. Check out Crafting Amongst Friends on Facebook or stop by at 16 Opera House Square, Claremont, NH. You can find my Etsy shop here. What gave you your first business “rush”? Have you ever consigned your crafts? How did it work out? Please share! I have spent the last few months learning everything I can about running a small business and specifically an Etsy shop. I am a new Etsy shop owner and I make crocheted items and you can visit it here. I never could have dreamed how much information there is out there and how much there is to learn. I made this list to compile some of my favorite resources in one place for anyone out there who is looking for the same information I was. All of the links and articles included come from websites that are full of great articles and information. I included them because they are informative, helpful, and going to the article will lead you to even more help. 7 Ways to Increase Traffic to Your Etsy Shop: This article simplifies how to use the world of social media to your advantage in a specific way. There is a really interesting 5-10-5 rule that will help you allot your time online efficiently and give you a more solid promotional plan. Planning for Positivity in 2014: There are some great free printables included here but overall it is a very helpful post on goal setting for your business. There are some ideas on goals to get you thinking and a great goal setting system. Starting an Etsy Shop: 8 articles you must read when setting up your shop. This post includes a ton of great resources and will help direct you to where all of the great information is on the internet. 20 Ways to Get More Traffic to Your Etsy Shop: These ideas are very creative and again there are very specific ideas to help boost your sales. Handmade Success: This is a great overall website including many resources and articles for all things Etsy. It also includes resources for blogging and crafting. Ready for Etsy Success? : Straight from the Etsy Seller’s Handbook this is another goal setting blog. Having goals is so important so you know where your shop is going and can plan how to get there effectively. Selling Handmade: Packaging Your Etsy Product: Often overlooked in the selling process, packaging is an important way of leaving a lasting impression with your customers. Etsy Success: 4 Things to Do Now: Not only are there links to other articles here, there is a simple list of how to get great sales! This is also a blog straight from an Etsy team of sellers who know what they are talking about. Back to Work: Tips to Improve Your Etsy Business: This is a great article for a brand new seller or someone who wants to take their business to the next level. It focuses on the basics that you may be neglecting and includes other things you may not have thought of at all. 10 Tasks To Do in the Quiet Months: Every seller has a slow period and instead of panicking this post gives some insight into how you can use the down time to your advantage.